Steema is pleased to inform you of the availability of latest TeeChart for Xamarin.Forms 2018 v4.2018.4.26 release. Steema is pleased to inform you of the availability of latest TeeChart for Xamarin.Forms 2018 v4.1.2018.01040 release. Steema is pleased to inform you of the availability of latest TeeChart for Xamarin.Forms 2017 v4.1.2017.10170 release. New TeeChart NET bundle options! 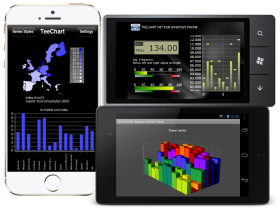 Steema is pleased to announce the introduction of the TeeChart for NET Enterprise Edition. TeeChart offers a wide range of common and specialized chart types, gauges and maps with customizable tools for data visualization. First presented at Xamarin Evolve in 2014, TeeChart for Xamarin Forms now includes support for UWP. TeeChart is fully interactive, supports custom-drawn client elements on the canvas and offers 2D and 3D charting options for a range of applications types, from high-speed real-time & financial, scientific & business, to presentation graphics. Steema is pleased to inform you of the availability of latest TeeChart for Xamarin.Forms 2017 v4.0.2017.27030 release. Steema is pleased to inform you of the availability of latest TeeChart for Xamarin.Forms 2016 v4.0.2016.11220 release.